Saudi Arabia’s Crown Prince Mohammed bin Salman today said he saw investment opportunities of more than $100 billion in India over the next two years as he began his first official visit amid tensions between India and Pakistan over the terror attack in Pulwama where over 40 Central Reserve Police Force (CRPF) soldiers were killed. India rolled out the red carpet for the crown prince as it seeks diplomatic support against Pakistan following the terror attack in Kashmir. The crown prince was also given a lavish welcome this week in Pakistan where the two sides signed memorandum of understanding valued at about $20 billion to help prop up Pakistan’s economy. 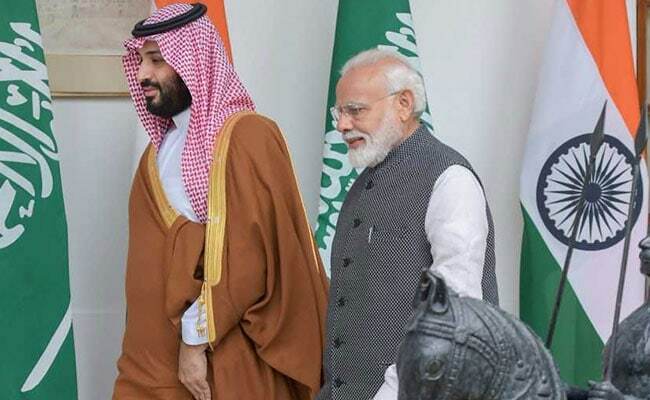 In a joint press appearance after talks with Prime Minister Narendra Modi, the crown prince said terrorism was a common concern and Saudi Arabia was ready to share intelligence with India to tackle it. India blames Pakistan for not doing enough to roll up terrorist groups that operate from its soil including the one that claimed responsibility for the Jammu and Kashmir car bombing on Thursday last week. Pakistan denies any involvement in cross-border terrorism and said it would retaliate against an Indian attack. Saudi Arabia’s formidable domestic security structure helped put down an al Qaeda bombing campaign over a decade ago. But the kingdom continues to face occasional attacks by Sunni ISIS fighters and Shi’ite terrorists in its Eastern Province. Riyadh also leads a coalition of Arab states fighting in support of Yemen’s internationally recognised government against the Iranian-aligned Houthi fighters, who regularly fire rockets across the kingdom’s southern border. Giant petroleum and natural gas company Saudi Aramco said it was in talks with India’s Reliance Industries Ltd for possible investments and was seeking other opportunities. Both India and Pakistan had expected a scaling up of investments on the crown prince’s first tour of the region since the storm over the murder of Jamal Khashoggi, a Washington Post columnist, at the Saudi consulate in Istanbul in October. The killing of Khashoggi, a known critic of the crown prince, has strained Saudi Arabia’s ties with the West and battered the prince’s image abroad. He’s next due in China. The European Commission has added Saudi Arabia to an EU draft list of countries that pose a threat to the bloc because of lax controls against terrorism financing and money laundering, sources told Reuters last month. But PM Modi has sought to use India’s fast-growing economy to attract more investment from Saudi Arabia and other Islamic nations since he took office. During the press briefing, PM Modi said he had agreed with the prince to strengthen cooperation on counter-terrorism and naval and cyber security. The two countries signed agreements on investment in infrastructure, housing sector and tourism.